The TPE Clyde Race Tracker tour had earlier reversed on the Wishaw connecting line to make its way to Edinburgh Waverley and through to Craigentinny T&RSMD, so the end carrying "The Railway Children" headboard was leading into the depot. 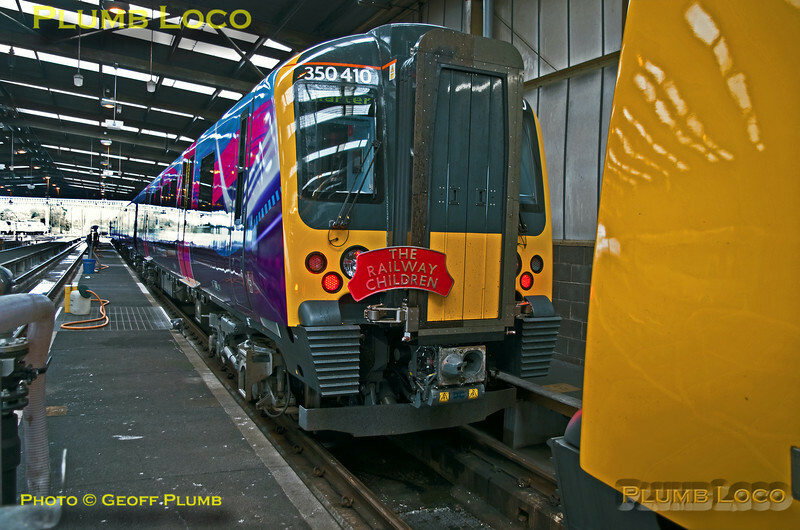 The train has now come to a halt in the Carriage Cleaning Shed Road No.1 and 350 410 is now facing fellow TPE 350 402, before departing once again, now running as 1Z51 to Glasgow Central. 13:12½, Saturday 26th April 2014. Photo taken with permission and under supervision. Digital Image No. IGMP3618.